As an Irish girl, I was pretty much reared drinking tea. At all the major events in my life, good or bad, there was always tea. Tea is probably my ultimate comfort in life. Even when my dad was really sick, the whole family would regularly gather around the kitchen table for a comforting cup of tea. Tea is something of a religion in Ireland. The rivarly between brands (Barry’s vs Lyons) is strong. Everyone has a particular way to make their own tea: how much milk, sugar or not and how long to steep. 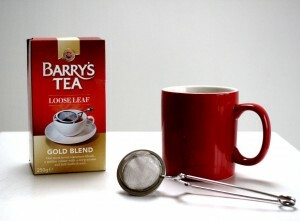 In our house, we drank Barry’s tea red label and tea was steeped to make it strong. The Irish have lots of ways of describing tea. If it was too weak, it’s like nun’s pee (!!) and too strong it’s like porter. I never gave much thought to my tea-drinking until I began the Specific Carbohydrate Diet (SCD). I never thought I would get used to drinking black, sugarless tea but now I would never go back. Recently, I had a discussion with someone regarding tea bags. “Did I know that tea bags were bleached?” they asked me. Bleached? Are you serious? Why would anyone bleach something we consume. So, I decided to look into the tea bag. I was pretty horrified by what I found out. It turns out that bleaching isn’t even the biggest thing to be worried about. Naively, I assumed that tea bags were made of some kind of paper because that’s what they look like, right? Wrong! If they were made of harmless paper then they would melt in boiling water. For a material not to melt in boiling water, they need to be made of….drumroll please…you guessed it, PLASTIC! The horror! Have I been boiling plastic and drinking it several times a day for my entire life? Luckily, loose tea is readily available in most supermarkets and guess what? It tastes AMAZING compared to tea bags. I will never go back to using tea bags. Free the leaves, I say! A real eyeopener, I’m in total shock, thank you for the info Maria! You’re welcome Linda. Once you try real tea, you’ll never go back! The taste of loose tea leaves is more tasty than any other ‘Cupáen tea’,, if i take tea bags @ tea break @ work ,i can taste the bleach in the so called ‘TEA’.